Most film festivals take place in a movie theater, which is natural, right? But, for the second year in a row, the Black Rock City Film Festival is bringing the underground film watching experience back to real nature. 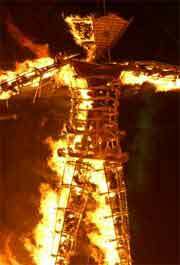 In the desert, in fact, when it takes place this summer at the annual Burning Man arts festival. Presented by the fine folks at the Boston Underground Film Festival, the Black Rock City Film Festival will take place at night in the desert that begins with a Tuesday night Red Carpet Opening Night Gala and a Friday night closing Wrap Party. And, every night will feature a pre-screening Cocktail Hour. If you’re interested in submitting, please visit the official Black Rock City Film Festival website. Also, the festival has a Kickstarter campaign running to raise funds for hosting the Engine Theater. Click to donate! Wide-ranging works of experimentation at the crossroads of cinema, visual arts and new technology. A laboratory that pushes beyond traditional narrative and aesthetic forms in a program spanning films, installations, performances and transmedia projects. Please visit the Festival du nouveau cinema’s submission page to submit. Please visit the POW Fest official site to submit.